← “Listen To This” is a great read! 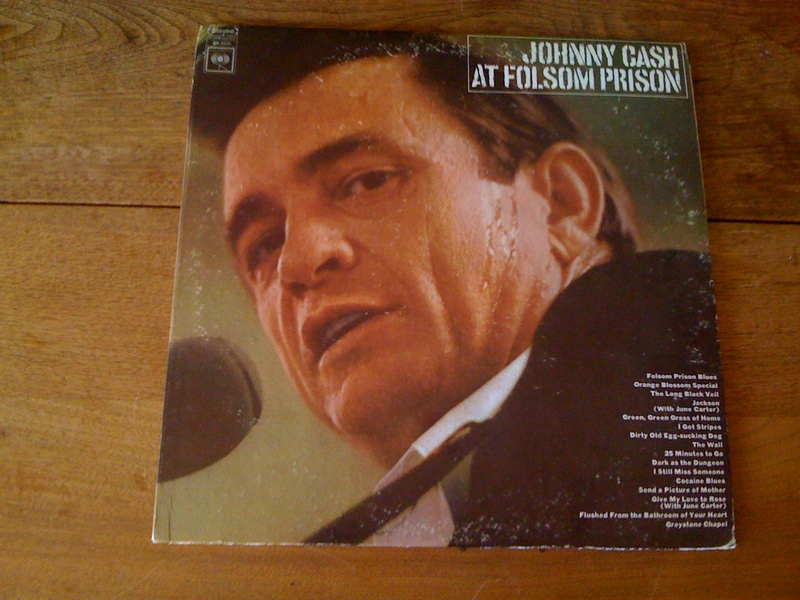 This record was made on Johnny’s fourth trip to Folsom prison. It was Johnny’s idea to do a live album from prison. It took him six years to convince Columbia records to allow him to record the album in Folsom. Side one begins with the song you would expect: “Folsom Prison Blues”. The crowd erupts accordingly. Other highlights are “Cocaine Blues ” and “The Long Black Veil”. This last song is covered on Roseanne Cash’s album “The List”. “The List” is a recording that Roseanne made after her father died. Before his death he gave her a list of 10 songs that he felt she should record. Both Johnny’s version and Roseanne’s versions are riveting. Forgive the long pauses before the music starts. I forgot to edit the tracks before I uploaded them. Send A picture Of Mother, The Wall, Dirty Old Egg-Sucking Dog, Flushed From The Bathroom Of Your Heart, Jackson (Sung with his wife, June Carter), give My Love To Rose (Also with June Carter), I Got Stripes, Green, Green Grass Of Home, and Greystone Chapel. This entry was posted in Country Music, Vinyl and tagged Folsom Prison, Glen Sherley, Johnny Cash, June Carter. Bookmark the permalink. You’re right, John-this one really does deserve a review of its own, definitely not just another live album. I highly recommend his autobiography-I read it on a long flight last year. What an amazing figure, a true giant of American music and a man who truly lived his Christian values. Loved Roseanne’s cover of The List, she is a wonderful artist in her own right. Which reminds me….if you haven’t heard the album Fate’s Right Hand her ex-husband Rodney Crowell put out in 2003, stop whatever it is you are doing and order it right now. Trust me on this one-of the many records I’ve bought 10 years or so, this one got under my skin perhaps more than any of them. Thanks for the tip on Rodney Crowell. I don’t have that album. But, based on your endorsement I’m going to get it asap. Thanks, Ken!